It’s Football Season! 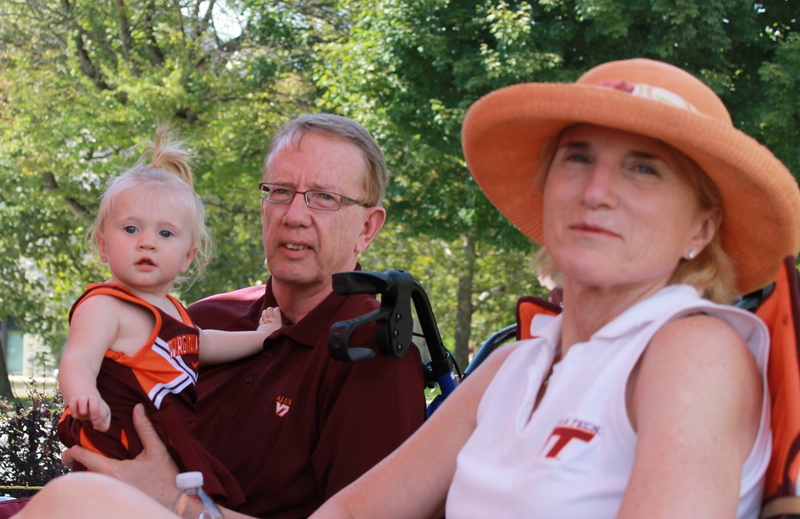 Let’s Go….Hokies! I don’t know much about this year’s very young Virginia Tech football team, but I have been anticipating this season more than any season in a LONG time. I wasn’t blogging last year during football season, so you wouldn’t know that I only made it to one game. Not only was I in the third trimester of my pregnancy, but I was also in recovery from having a baby (making traveling very difficult). We are all geared up to attend several games this year (both home and away) and with the baby! 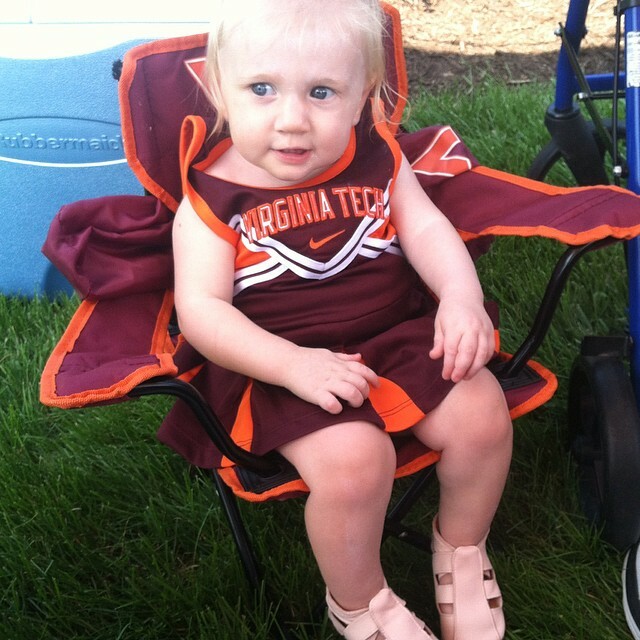 In my excitement for the upcoming game, my daughter was dressed to show off her affiliation at daycare on Friday. You have to teach them young! 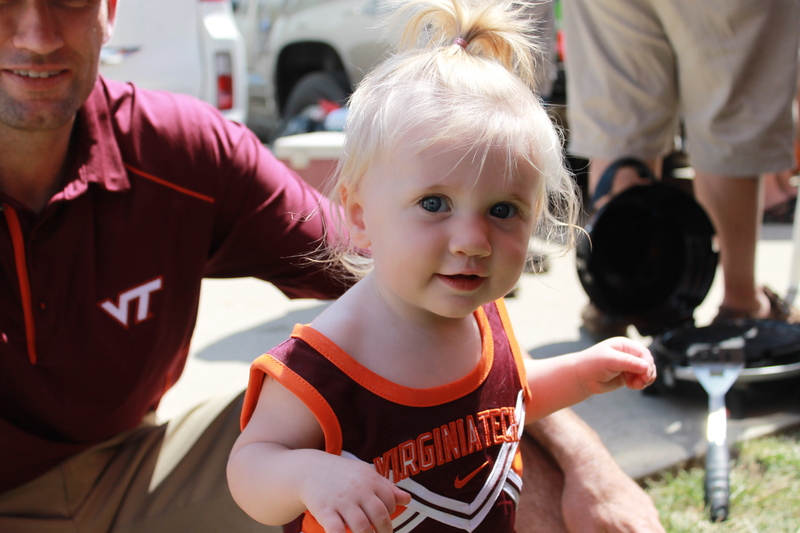 She comes from a long line of Hokies, so before she can decide which team she wants to wear, I plan on providing as much influence as I can. 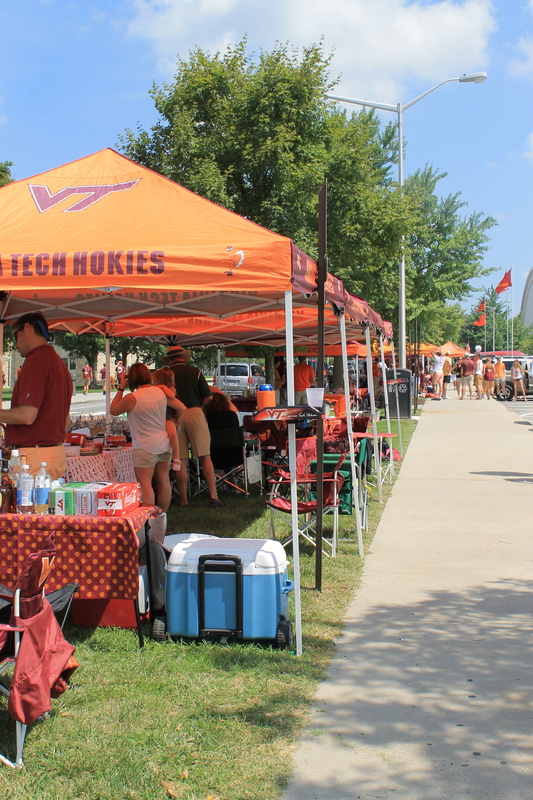 Part of any game day experience in Blacksburg is tailgating. 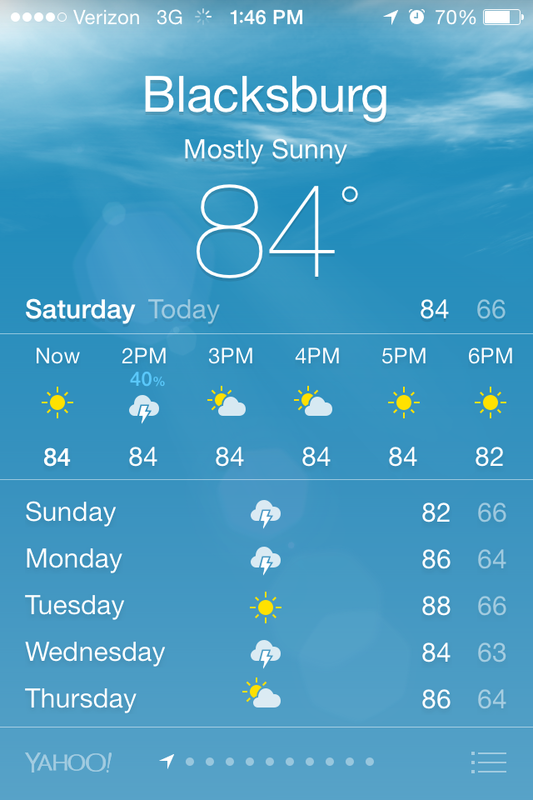 Especially when the game is in the afternoon and the weather is as unbelievable as it was this past weekend. No clouds in the sky. Tents lined Washington Street by noon (for a 4:00 game). 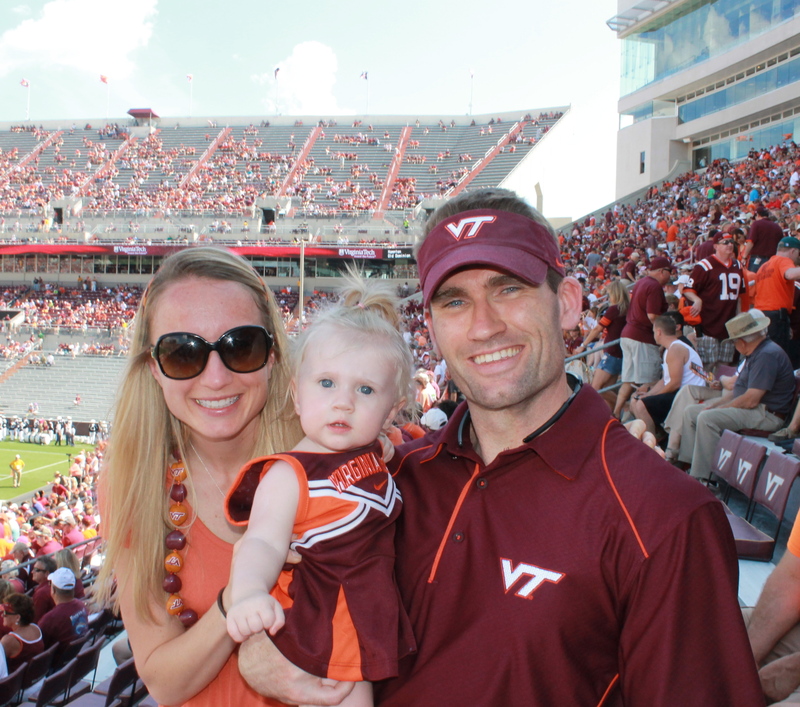 Hokies were wearing their colors with pride. It’s a new season, which means new hope for a national championship. If you haven’t been to Blacksburg, but you have heard about the “Hokie Stone”, this is it. 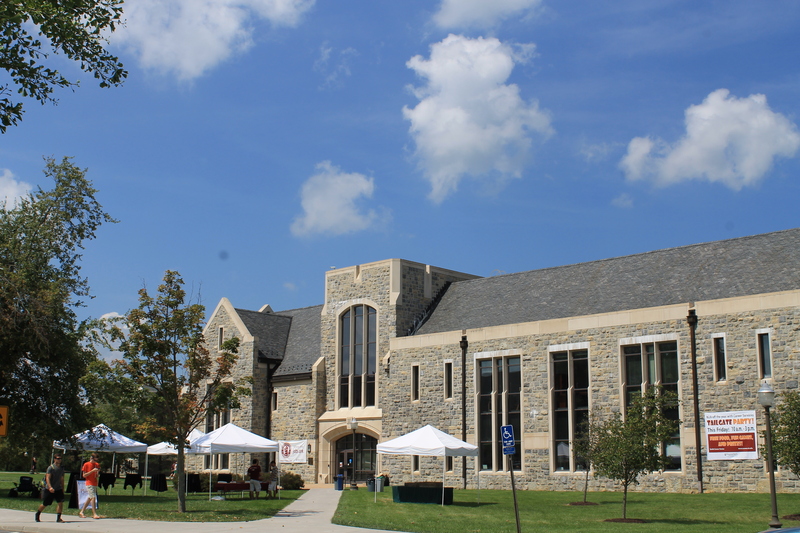 Almost every building on campus as the same facade (as seen above). Even as visitor, it is incredibly easy to know when you wander off campus (by just looking at the buildings). 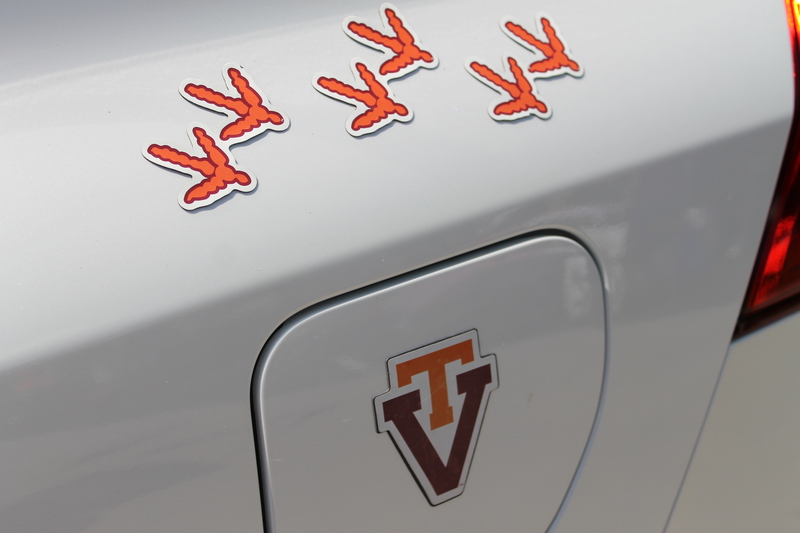 Don’t be surprised if you also see a lot of vehicle Hokie flair on game day. 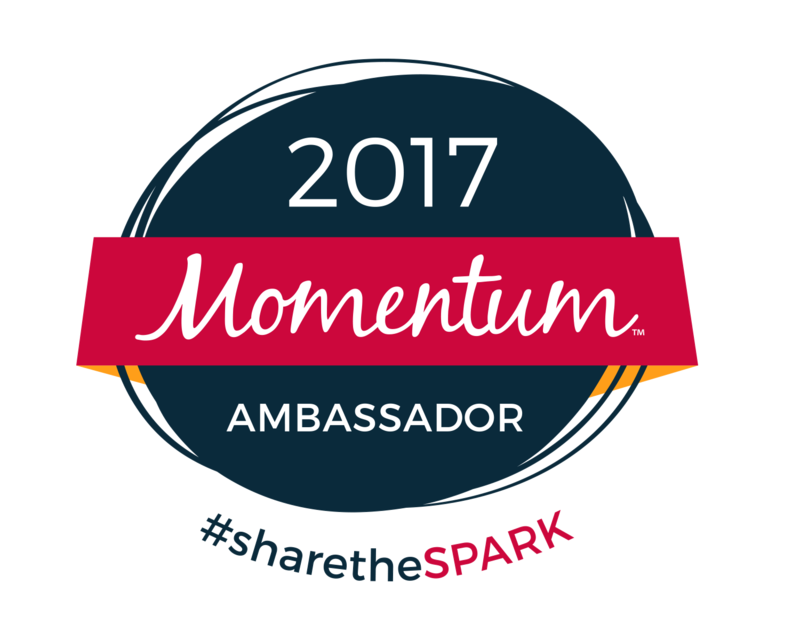 If you are traveling towards Blacksburg prior to/or in the 24 hours following a Hokie game, you are likely to run into this flair. I’m sorry if you happen to get stuck in the caravan of Hokie traffic. Just roll with it. 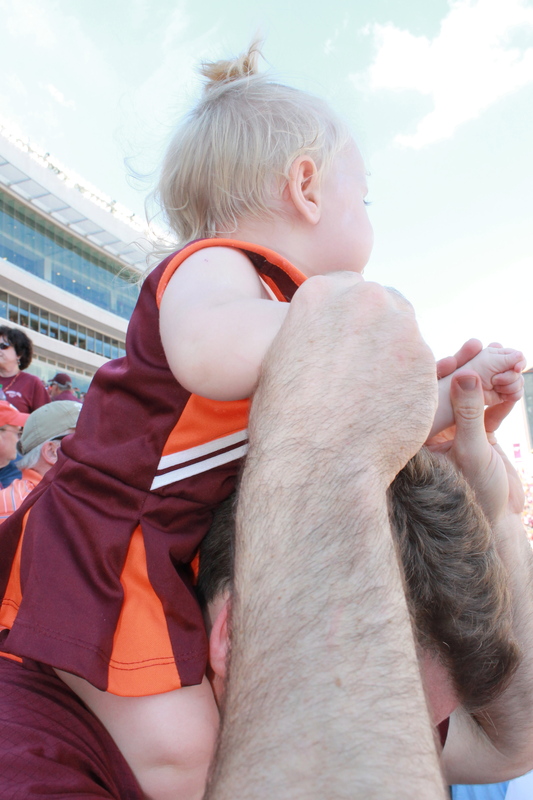 Hokie fans are some of the most genuinely fun fans in the game. Give them a wave or honk your horn! 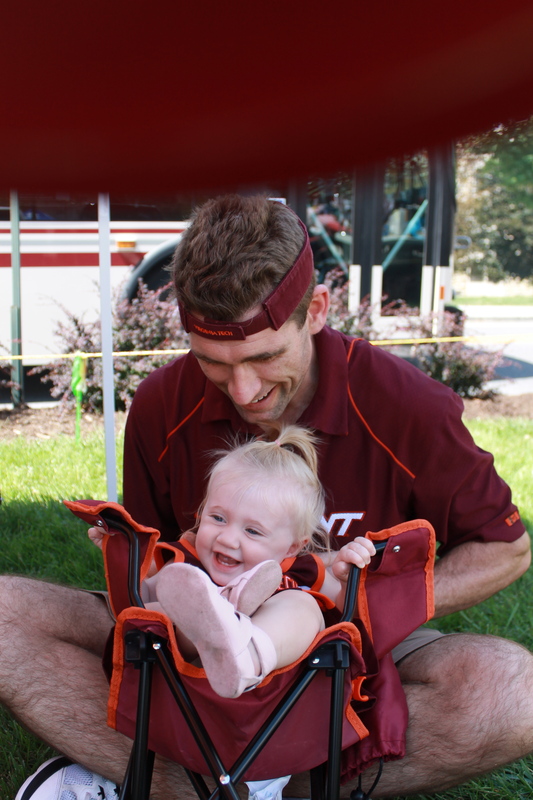 My daughter set up shop at the tailgate in her own toddler sized tailgate chair. 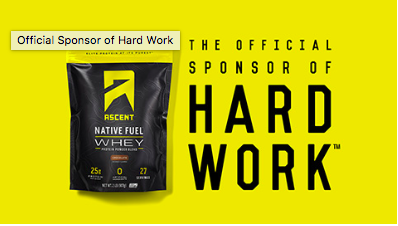 I mean who thought of this? What a great idea! She was like a mini adult hanging out watching everyone socialize. Check out the pictures below of everyone enjoying the beautiful day! We didn’t have high hopes for how long she would make it, but she was unbelievable. The buildup of the walk into the stadium was incredible. We cooled off in the car for 20 minutes prior to our trek to the stadium. For her first game, I had to get her there for the “Enter Sandman” entrance. 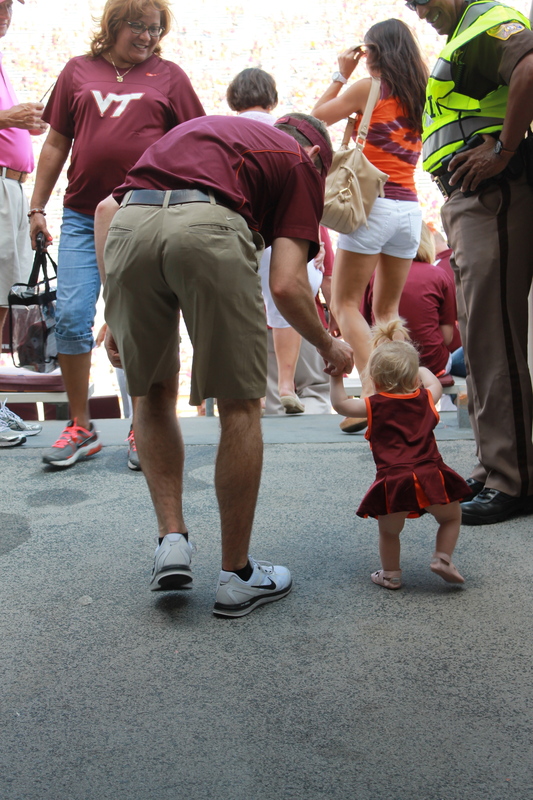 She just started taking her first steps last week, so we also wanted her to walk into the stadium to her seats. This will be a moment of my life that I am so happy that I have a picture of. I can literally remember the days when I was a kid doing the same walk into the stadium holding my dad’s hand. To be able to share this with my own child and the amazing man that I call my husband was so special (it literally brought a little tear to my eye). Look at how big she is already! I don’t know if it is all of the Flywheel music playing all of the time that made this kid used to noise, but she loved the game day atmosphere. I’m talking arms flailing to the beat, head bobbing and legs kicking. Just ask to see the video! Unfortunately, by halftime she had reached her limit. Good thing Virginia Tech was winning! We grabbed waters before heading back to the car (and home!). I bring this up because Virginia Tech continues to amaze me with how to manage lines. Forget waiting in the same line as people who want food (if you just need a drink). 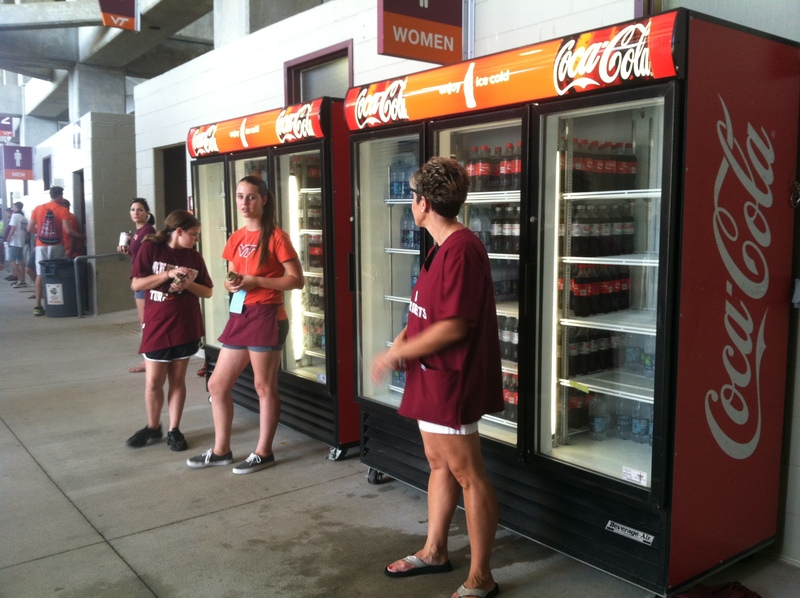 Bring a little cash and you can grab a beverage out of the coolers from one of the volunteers! Our trip to Virginia, was mostly about football, but we also found time to get some great workouts in while also eating well. Update coming this week. 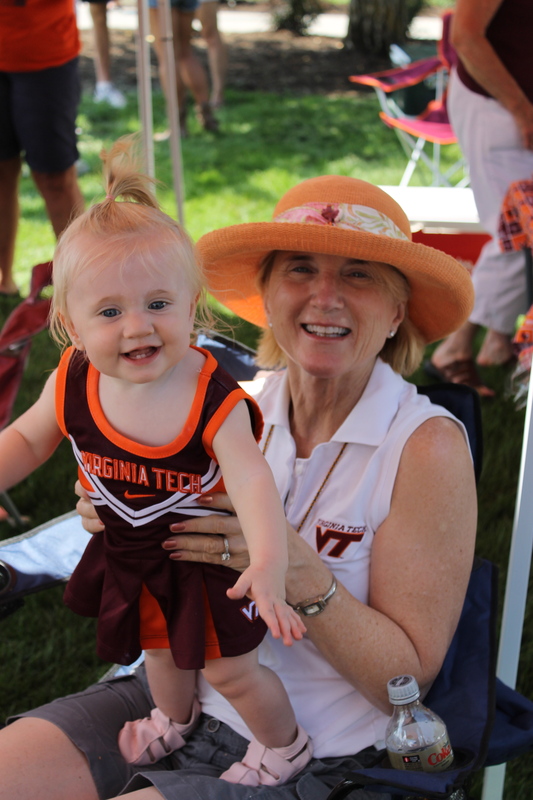 In the meantime, go Hokies! This entry was posted in food, travel and tagged Blacksburg, Enter Sandman, hokie stone, Hokies, tailgate, Virginia, Virginia Tech football, Washington Street on September 1, 2014 by flyjenduf.